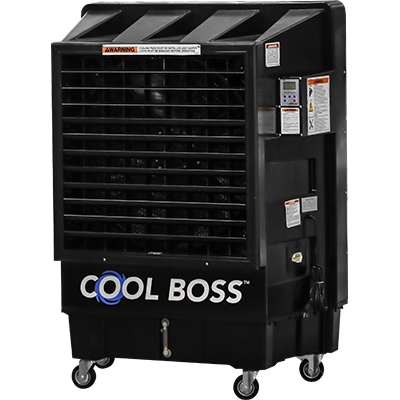 The CB‐30 Cool Boss™ swamp cooler, sometimes called an evaporative air cooler, provides a low‐cost, environmentally‐friendly way to keep shops cool and workplace areas comfortable, even during the hottest summer months. In order to keep shops and workplace areas cool, the CB-30 uses ordinary tap‐water combined with forced air to reduce air temperatures by as much as 26°F. Best of all, it’s a super-effective cooling device that costs about a dollar per day to operate. Not to be overly repetitive, but one dollar is incredibly cost-effective—no fan or air conditioning device compares to the cooling potential and savings that are possible with the CB-30 Cool Boss™ swamp cooler. The Cool Boss is an industrial strength, cost-effective solution to an everyday problem. Typically, when outdoor temperatures rise, the efficiency of conventional air conditioners is reduced, causing electric bills to skyrocket. The Cool Boss air cooler is not an air conditioner, so there are no costly high‐amp compressor motors, no environmentally toxic chemicals and refrigerants to mess with and no ducting to install. Just fill the high-capacity reservoir up with water from your tap (or connect to a garden hose for auto‐filling convenience), then plug it into a standard 110V outlet. In just minutes, and for less than a dollar a day, you’ll quickly transform your home, office, work area or outdoor living space into a cool retreat. No installation required. It’s ready to use right out of the box—just plug it in and add water. Cool Boss features a micro-computer programmed control panel with LCD display and comes with a convenient remote control. A built‐in timer allows the unit to be programmed to turn on or off at pre-selected times. One large 30” diameter fan operates at three selectable speeds, and a thick cooling pad ensures even water distribution and reliable heat absorption. Automatic swing‐louvers oscillate side-to-side and help circulate cold air more efficiently, providing a larger cooling area than traditional evaporative air coolers. Four rubber casters with brakes allow easy mobility. To promote a healthier shop environment, a negative air ionizer can be turned on or off. The ionizer charges air particles, causing dust and debris to stick to walls and the floor. This keeps the air you breathe cleaner and makes cleanup faster and easier. 2,500 - 2,800 sq. ft.